Located in front of the palace-turned-convention-center, Palais Brongniart, the small agglomeration of tents that makes up the Marché Bourse serves the surrounding community of bankers and business people who gather at Place Bourse for their pause déjeuner. Marché Bourse is one of the few markets that is open in the afternoon (along with Marché Anvers, Marché Baudoyer, and Marché Bercy) allowing short lunch breaks and late nights at the office to be rewarded with a hot lunch and a selection of bio wines. Open until 20h30, Marché Bourse is a good market to keep in mind if you, like me, have a hard time making it to the morning markets. The market stands mostly offer hot meal options served to go (no seating area is provided for market-goers). A variety of international options, such as Indian curries and Moroccan bricks and sandwiches are available to stoppers-by. Vegetarian options are limited as are organic ingredients (the veggie-friendly Bio Burger is a short walk away for hungry herbivores). While I was disappointed to see that at at Marché Bourse fresh fish and veggies were limited to one stand each, both offering industrial-looking products, I was thrilled to find that the market has a caviste who specializes in organic wines made by independent producers. Since naturel wines are my current obsession, I went directly to this vendor (who advertises his English speaking skills and I'm sure is happy to chat with foreigners and the French alike) and chatted with him about the various vintages he had for sale. Of all the bottles, he showed me three that were low-sulfite natural wine options (I ended up deciding on a Sauvignon from the Touraine region for €8,50). Working closely with small vineyards, this vendor develops a relationship with the producers and hand picks a selection of quality wines to bring to market. This relationship is important to take into account when it comes to "natural wines" as the term is a wide umbrella for various methods of wine-making and only a knowledge of the producer and his or her winemaking process will guarantee that your wine is truly au naturel. A concentrated yet quality selection of wines from many French regions is offered at this stand, with three different bottles open and available for tasting. These bottles rotate every week, and the friendly vendor suggested I visit him next week to do a more extensive tasting of his vins naturels. This particular wine stand makes the Marché Bourse worth a visit. 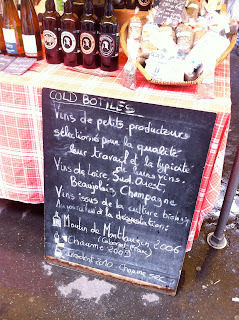 Weather on your way to an apèro and in need of a bottle to go, or after a nice lie-in and an afternoon stroll down to the market for a wine cellar restock, Marché Bourse is open for business.